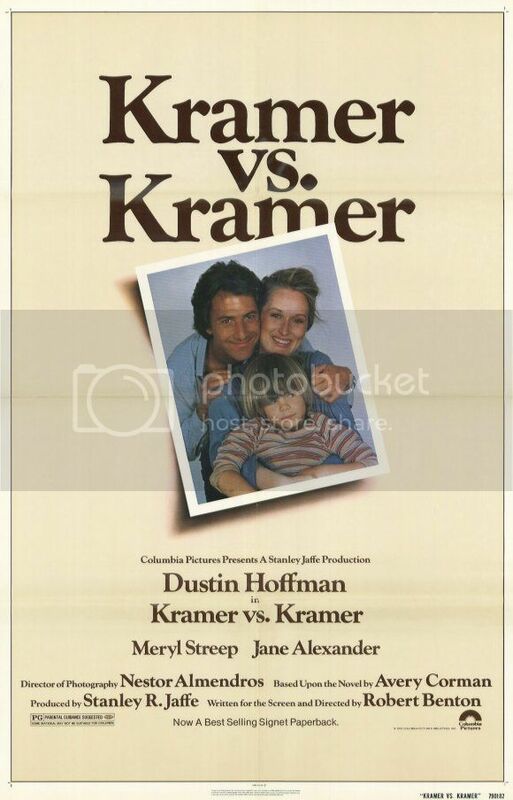 Kramer vs. Kramer deeply troubled us. Ostensibly a liberal film from the late 70s, about a New York City couple undergoing a painful divorce and custody battle, it ended up being insidiously sexist. How did it win so many accolades back in the day? Were people really so blind? Was this meager bone tossed to women, with its MARROW OF SEXISM (ahem), really meant to be progressive?! Come on! While it was nominally about the women's lib movement, it was basically about how that movement could become a vehicle for one man to become closer and more emotionally open with his son. The women in the film (of which there are two - and, no, they don't talk to each other) are sidelined, their women's lib movement regularly mocked. The finale seems to say: after emancipation, there's no place for women. Ted Kramer (Dustin Hoffman) is a young, upwardly mobile New Yorker. On a day when everything in his professional life is going great, his personal life falls apart: he comes home to find his wife, Joanna Kramer (Meryl Streep), with a packed suitcase. Without much explanation, she walks out - and leaves him to care for their rambunctious, adorable 5-year old son, Billy (Justin Henry). The film then becomes essentially a father-son buddy film, as Ted learns to juggle work and homelife. Numerous social threads are woven throughout: Ted cites feminism as the cause of his wife's antics, he has trouble performing against "all the other mothers" at PTA meetings or play-dates, and his office is basically intolerant of anything less than "110%". Big client, you know. Of course, Ted stumbles and bumbles, but eventually emerges triumphant. And it's very much at the expense of, well, women and women's issues: Joanna is villainized, even in Meryl's capable hands, and she's presented as a trembley, flakey cipher with only one setting: timid, borrowed rebellion. It's really painful to watch. It's interesting to compare this film to another period divorce, The Squid and the Whale. That film's tortuously-divorcing parents were well-rounded, understandable people. They were weak - and Jeff Daniels's Bernard was perhaps more bluntly odious than Dustin Hoffman's Ted - but one could still sympathize. The Kramers, unfortunately, just felt like straw people in a straw world.